We have earned a reputation for being very fast when making small additions or changes. There is never a delay when adding office cubicle components. We provide direct service assistance from the company owner and supervisor to handle any order or problem. Each office installation has a lead installer. Our least experienced lead has 8 years in the field. We follow up with service after the sale. Also, there is no environment we have not implemented an office installation. From high-rises to small homes, from outdoors to ships at dock, we have installed everywhere. Another advantage is our design process that begins with a custom layout and culminates in office installation. Since we measured the space we have a good understanding of the in and outs of the building and each room. Configuration (also referred to sometimes as “reconfiguration”) is a value-added service that creates new opportunities for business. 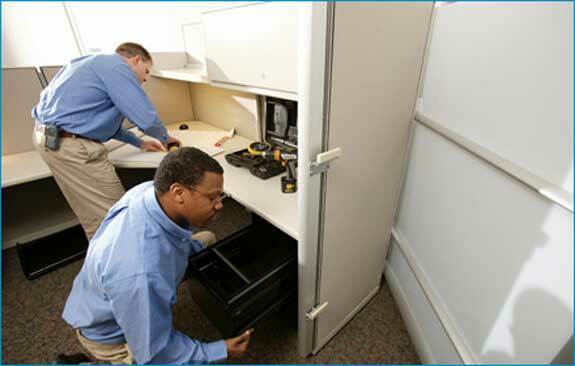 Reconfiguration involves reorganizing existing office cubicles and office furniture into a new layout that better serves your organization. It begins with an initial inventory count of existing office cubicles and office furniture product. Designers take space measurement of your facility and design a free site layout of the proposed reconfiguration. 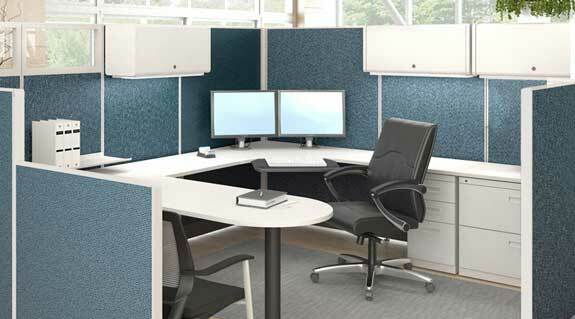 Office cubicle and furniture reconfiguration is most often needed when companies hire new employees and need additional work-space created within the office. Other configuration projects are implemented when companies move from one floor to another, or to another location altogether. These projects may also include re-purposing existing office cubicles for different functions. For example, a standard desk cubicle can be re-purposed to function as a receptionist desk cubicle). We don’t feel like we are overstating anything to frankly state that we design better layouts than many competing office furniture dealers. Many of the competing bids we have been shown by clients are not really designed layouts—they are simply plug and go arrangements of office cubicles, tables, desks, and seating. Because this service is usually free in our industry most of the furniture companies that do layouts, burn though it fast. Like those of our competitors, the layouts we develop are free. However, unlike those of our competitors, the office furniture layouts we give you are consciously developed in accordance with the purposes of your organization. This saves on both the time and the costs of office installation.